SQL Server 2017 now offers adaptive query processing, a new set of features aimed at improving query performance. 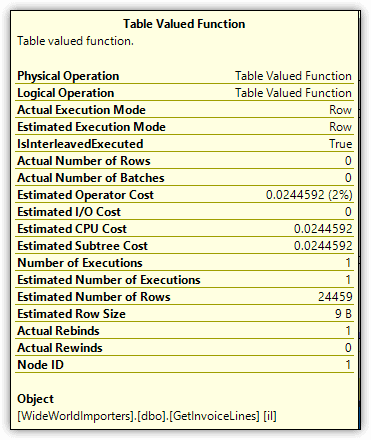 Adaptive query processing addresses issues related to cardinality estimates in execution plans, leading to better memory allocation, join type selection, and row calculations for multi-statement table valued functions (MSTVFs). Prior to SQL Server 2017, if a query plan contained incorrect cardinality estimates, the database engine continued to use that plan for each statement execution, as long as the plan remained cached, often resulting in less-than-optimal query performance. For example, the execution plan might allocate too much memory for some queries, while underestimating the memory requirements for others. The adaptive query processing features attempt to resolve these types of issues by providing more accurate cardinality estimates when calculating query execution plans. SQL Server 2017 enables these features by default on databases configured with a compatibility level of 140 or greater. The WideWorldImporters database is used for all the examples in this article. If you have this database installed on your system, you should be able to try out the examples without making any changes. If you want to use a different database, you can create SELECT statements comparable to the ones shown in the examples. The same principles should apply to any database with a compatibility level of 140 running on SQL Server 2017. If you run this SELECT statement after executing the preceding ALTER DATABASE statement, the SELECT statement should return a value of 140. As already noted, these features are enabled by default. However, you can disable or enable each one individually, without changing the database’s compatibility level. The following sections cover the three features in more detail, including the steps necessary to disable or enable them. SQL Server uses memory to store row data during join and sort operations. 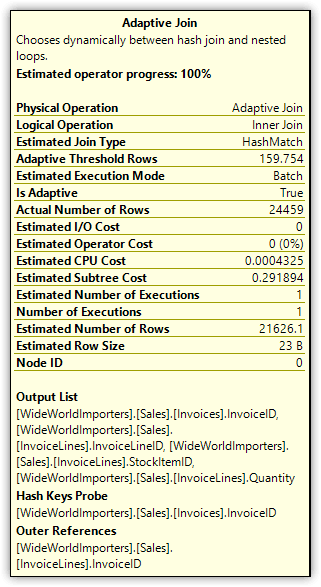 When compiling an execution plan, the query engine estimates how much memory is needed to store those rows. If the memory estimate is too small, excess data will spill over to the disk, impacting performance. If the estimate is too large, memory is wasted, impacting the performance of concurrent operations. The memory grant feedback feature helps remedy this situation by recalculating the row memory requirements when the statement is first executed. If the initial estimate is off, the cached plan is updated. 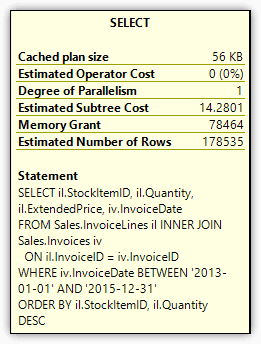 Subsequent executions can then benefit from the new estimate, as long as the query plan remains in cache. The SELECT statement returns data about the database’s scoped configuration settings, as shown in Figure 1. Row 6 of the results includes the DISABLE_BATCH_MODE_MEMORY_GRANT_FEEDBACK option. Notice that the option’s current value is 1 (ON) and that the default value is 0 (OFF), indicating that memory grant feedback is enabled by default (but only for databases with a compatibility level of 140 or greater). After the statement runs, go to the execution plan and hover over the Select operator to display the operator’s details, which are shown in Figure 2. The Memory Grant attribute indicates that 78,464 KB of memory is required for the query’s row data. No matter how many times you rerun the SELECT statement, you should receive the same Memory Grant total, as long as the query plan remains cached. Even if you’re receiving a different total than the one shown here, the behaviour should be the same. When you turn the DISABLE_BATCH_MODE_MEMORY_GRANT_FEEDBACK option to OFF, the option is no longer listed in the sys.database_scoped_configurations table. Only when you set the option to ON is it included in the table. This is true for all the scoped configuration options specific to enabling or disabling adaptive query processing features. SQL Server provides several methods for clearing the cache, so pick whichever one works for you. The DBCC FREEPROCCACHE statement is a fairly straightforward approach, as long as it’s okay for all query plans to be cleared from the cache. If it’s not, you’ll have to specify the specific plan you want to remove. The first time you rerun this statement, you should receive the same results as before, with the Memory Grant attribute showing a total of 78,464 KB of memory, or something close to that. However, when you then rerun the statement, the total should be much lower. On my system, the subsequent executions resulted in a Memory Grant total of 14,592 KB, as shown in Figure 3. When I tested the memory grant feedback feature on my system, I reran the above SELECT statement numerous times. Although I generally received the same Memory Grant total described here, in some cases I would get the original estimate or even another value. For the most part, however, the feature worked as advertised, despite the relatively few inconsistencies. The Memory Grant attribute should once again show a total of 78,464 KB of memory (or something similar), no matter how often you rerun the statement, at least until the plan is recached. When a SELECT statement includes a join condition, the query engine attempts to determine the best join type to use based on the estimated number of rows. Prior to SQL Server 2017, if an execution plan chose a bad join type, there was little that could be done, outside of specifying a query hint or specific join type. The new adaptive join feature helps to remedy this situation by choosing a different join type during statement execution, if necessary. After the first input has been scanned, the execution plan determines whether to change the join type to a hash join or nested loop join based on a calculated threshold. Not surprisingly, the DISABLE_BATCH_MODE_ADAPTIVE_JOINS option is specific to adaptive joins. However, the adaptive query processing options all work the same. To disable a feature, set its related option to ON, and to enable the feature, set the option to OFF. The SELECT statement returns the results shown in Figure 3, which indicate that the DISABLE_BATCH_MODE_ADAPTIVE_JOINS option has been set to 1 (ON) and that the default is 0 (OFF). The execution plan should look similar to the one shown in Figure 5, which shows a columnstore index scan, a nonclustered index scan, and a hash join. Because Live Query Statistics were enabled, the plan also shows the counts for the number of rows compared to the number of estimated rows, all of which should look fairly straightforward. In fact, I’ve included this example only to compare it with the query plan when adaptive joins are enabled. Now take a look at the execution plan. You’ll find a couple additions, including a Clustered Index Seek operator and, more importantly, the new Adaptive Join operator, as shown in Figure 6. The Clustered Index Seek operator is included for use by a nested loop join if needed. Notice that 0 of 24370 is specified, indicating that this branch is unused, which implies that a hash join was selected for this operation. The Adaptive Join operator determines what join type is used by calculating a threshold that determines whether to perform a hash join or a nested loop join, based on the row count. In this case, that threshold is 159.754, and the row count is 24,459. If the row count is greater than or equal to the threshold, the query plan uses a hash join. Otherwise, the plan uses a nested loop join. Figure 7 shows the details for the Adaptive Join operator after running the SELECT statement with the adaptive join feature enabled. This time, the details for the Adaptive Join operator will show the join type as NestedLoops and the threshold as 104.24. Be aware that the adaptive join feature comes with extra memory overhead and that it currently supports only SELECT statements (no data modification statements). In addition, the statement must be eligible for both hash joins and nested loop joins to use the adaptive join feature. When you include the OPTION clause, the SELECT statement will run just like it would in a database with a compatibility level earlier than 140, but without affecting the current compatibility level. 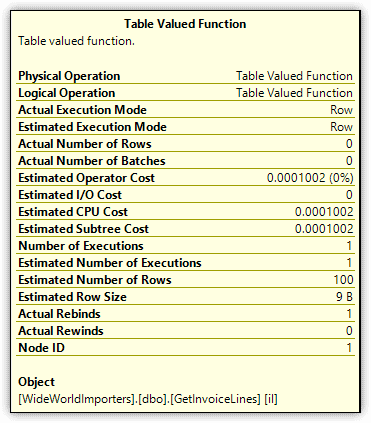 Prior to SQL Server 2017, when a statement included an MSTVF, the execution plan fixed the row estimate at 100, no matter how many rows the function might actually return. For small datasets, this usually wasn’t a problem, but when there was a wide difference between the estimate and the actual count, performance could suffer. 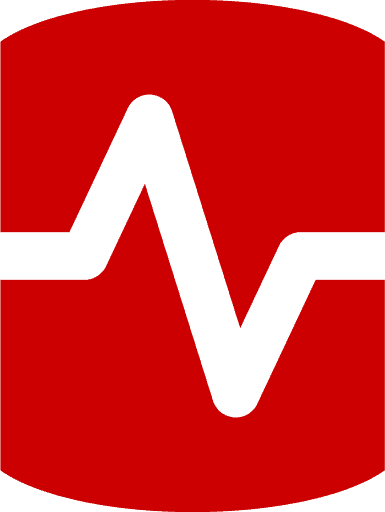 The interleaved execution feature helps address this issue by pausing execution long enough to capture a more accurate cardinality and then using that information for downstream operations. It should be noted, however, that using MSTVFs can still cause performance issues if they contain complex logic and will be joined against a large number of rows. The SELECT statement returns the results shown in Figure 8, which indicate that the DISABLE_INTERLEAVED_EXECUTION_TVF option has been set to 1 (ON) and that the default is 0 (OFF). The SELECT statement joins the GetInvoiceLines function to the Sales.Invoices table, passing in 100 as the function’s parameter value. Next, go to the execution plan and hover over the Table Valued Function operator. The operator details should show a value of 100 for the Estimated Number of Rows attribute, as shown in Figure 9. Although the Table Valued Function operator estimates 100 rows, the function actually returns 24,459 rows, a substantial difference between the two amounts. You can see this amount by viewing the details for the Table Scan operator (the Number of Rows attribute) or by querying the function directly. Finally, go to the execution plan and hover over the Table Valued Function operator. The operator details should now show a value of 24459 for the Estimated Number of Rows attribute, as shown in Figure 10. When you include this OPTION clause and specify the hint DISABLE_INTERLEAVED_EXECUTION_TVF, the Table Valued Function operator will once again show an estimate of 100 rows. Depending on the type of queries you’re running, the adaptive query processing capabilities can deliver a noticeable boost in query performance, especially as the size of your workloads grow. It’s unclear at this point whether Microsoft will be enhancing these features anytime soon, but it seems likely we’ll see some improvements. For example, Microsoft might eventually extend the adaptive join capabilities to data modification statements or extend the interleaved execution capabilities beyond MSTVFs. In fact, Microsoft has already released the public preview of the new Table Variable Deferred Compilation feature in Azure SQL Database and SQL Server 2019. If you’re moving to SQL Server 2017, you should consider updating the compatibility levels of those databases that might benefit from adaptive query processing. Just be sure to fully test the databases to make sure you haven’t introduced any new issues. If you’re uncertain whether your organization will be moving to SQL Server 2017, you might try out the adaptive query processing features when testing other new features to help you determine whether an upgrade is worthwhile.